In the 1970’s it was believed there were about 300 species of sharks worldwide. The number is now estimated at around 380. Finding a new species of shark, or any other creature for that matter, is one of the most exciting events a biologist can experience. In 1976 a particularly remarkable discovery was made in the waters of Hawai‘i. On November 15, 1976, a U.S. Navy research ship was operating in deep waters about 25 miles off Kahuku Point, the northern-most spot on O‘ahu. The crew had deployed two large parachute-like sea anchors to a depth of 500 feet, in order to hold the ship in position. When the sea anchors were hauled up, one of them had entangled a 14-1/2 foot shark, the likes of which nobody had ever before seen. The shark did not survive. 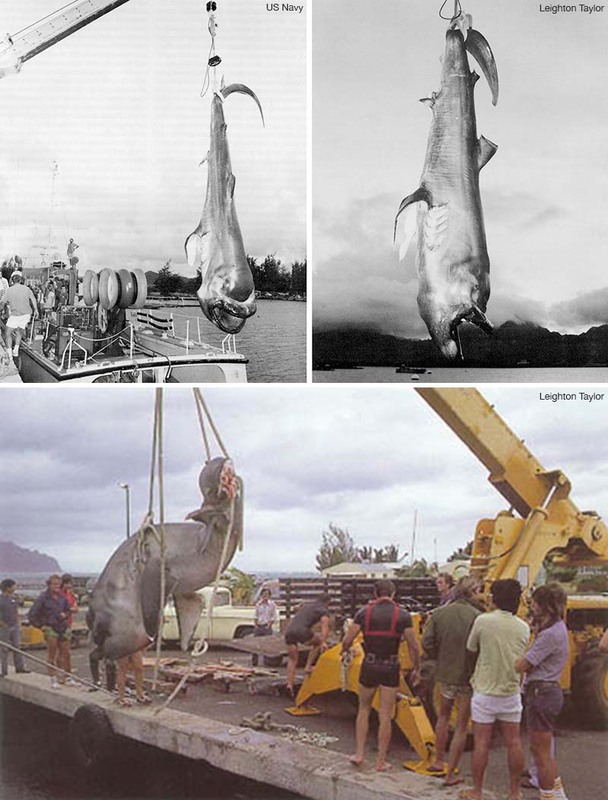 It took a lot of hard work, but the 1,500 pound shark was finally brought aboard the ship and transported to a Navy lab at Kane‘ohe Bay. Local marine biologists were summoned to the site, and calls were made to shark specialists around the country. None had ever seen or heard of such a shark. Megamouth was studied extensively, particularly its mouth, teeth, and stomach contents. Tooth and tissue samples were made available to researchers worldwide. It became clear early on that megamouth was a plankton feeder, hence its large mouth. It had fed mostly on deepwater euphausiid shrimp, and was only the third plankton-eating shark known, joining the whale and basking sharks in that category. It was placed in the order Lamniformes, which includes the basking shark, but also the white shark, threshers, makos, and sand tigers. It would take eight years before another megamouth was found, this one off California’s Catalina Island. Megamouth seems to be a deepwater species, possibly following the deep scattering layer of vertically migrating plankton which come closer to the surface at night. As of the end of 2003, 18 megamouths had been found, and there was an unconfirmed report of a May 26, 2003 sighting near Dana Point, CA. 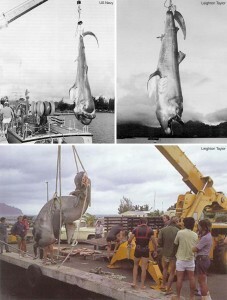 Megamouth I (the holotype, or first one described) is still held in the Bishop Museum icthyology collection in Honolulu. Megamouth remains one of the world’s most rarely seen sharks, and it’s amazing a fish that size could remain undiscovered for such a long time. 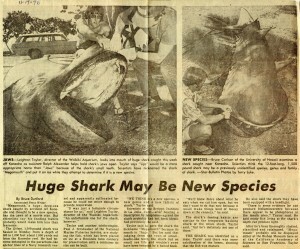 You can learn more about Megamouth from the Florida Museum of Natural History’s Megamouth page.